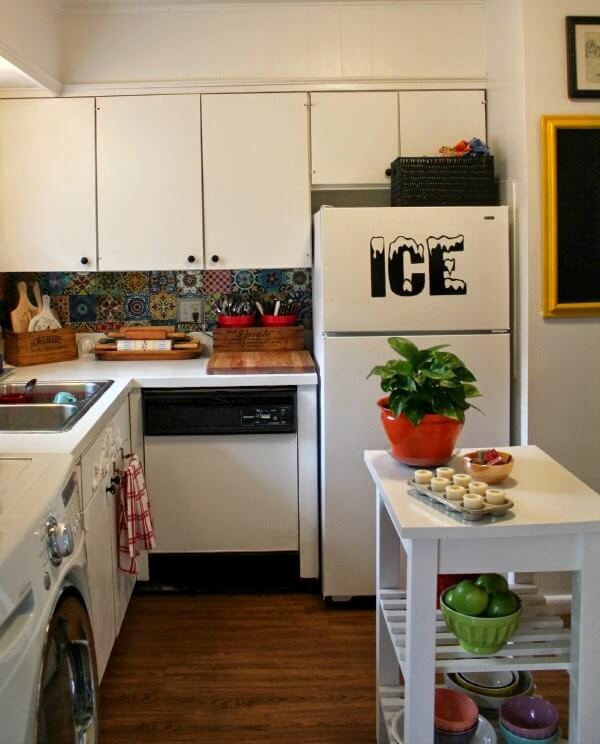 I grew tired of the style of my kitchen and decided to give my rental kitchen a boho look. First I ordered peel and stick tiles online and used them as a backsplash. 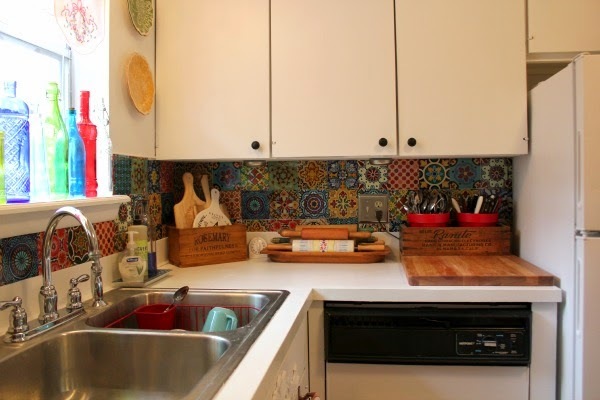 The peel and stick tiles that I ordered on Etsy are very colorful and completely changed the look of my kitchen. In this photo, you can see a white strip at the bottom. I don’t know what it’s called. But I found it in the flooring section at Lowes. It is made of rubber. I attached it with strong double stick tape, and painted it white. Now I have a barrier for water behind my sink. I guess you could call it a “faux” backsplash. Here you see another change, aside from the edges of my new window treatment. I purchased a different faucet. Some will say, you rent that apartment, why would you pay $69 for a kitchen faucet? You know my motto: Love it while you rent it. I absolutely hated that cheap faucet that I replaced. Hated it. You couldn’t clean around the plastic that houses the hot and cold water. The faucet I purchased was a Moen and the cheapest I could find. One thing I think renters have to come to terms with. That “some day” house you’re hoping to buy might never happen. You might be run over by a Fritos truck. You might get into debt and never have good enough credit. So put a little money in the place where you live NOW. You will be happier with it, and $69 for a new faucet is not a huge price to pay for being content with your kitchen. Then I added a new window treatment. I simply used a regular old extension rod and layered vintage linens across it. Just switch out the linens when you’re bored with the look. One of my favorite things about this whole redo is that the “faux backsplash” I came up with was under $10, and I had one whole section left. Here’s what I did with these textured counters that had all sorts of squiggly colors I hated. I used a very thick white paint, suggested by someone from Ace Hardware. With quite a few coats, it took away the texture, and my counters are now smooth. And then I used polyurethane to coat the countertops to keep spills and such from ruining it. It takes about a week to cure, so it should be cured now. Here is the newly painted kitchen island. The one I purchased for $45 last summer. I considered staining it. But I have absolutely no experience in staining furniture. So I just painted it white. I painted the red “EAT” sign an aqua color. I also bought new electric outlet covers. They are silver. Really this is not a big expense at all, and renters should think about making this small change. It just looks a whole lot better than those beige covers they slap on because they’re cheap. This old dishwasher (that I never use) did not escape my paint brush. Since it is never used, I don’t see a problem with painting it. So there you have it. My boho style apartment kitchen. If I move and lose a $300 deposit, I’ll deal with it. I’d much rather be happy with it while I live here. And who knows. I may never move. You're so clever! That rubber coving makes the perfect backplash! Do you have any idea what they use that for in flooring? Must be at the bottom of the wall is all I can imagine. Oh well, cheap and worked! Brenda they are used for kick plates at the bottom of cabinets. Brenda, I think your faux tiles look just great! They are really show cased with all the fresh white you have painted. I hope it's ok to say, I like this so much more than the previous make over you did on the kitchen. The two plates look very pretty with the new "tiles". Well done girl!! Of course it's okay to say! I love feedback, good or bad. This look is more cleaned up and light I think. I wanted black counters because that's what I'd ordered and had put in at the little blue house. But really, the white fits this kitchen better I think. I really like the new look! Much lighter and airier with the white instead of black ~ and I LOVE your window treatment!! Well, I couldn't figure out what to do with that window. The windows here are terribly ugly and cheap. You sure don't want to highlight them. I thought of all kinds of things, but finally, this was the easiest and I rather liked the concept of layered linens in lieu of a curtain. I like the new look. As for the "leaning" plant, maybe if you put it somewhere for a couple of weeks where it faces the sun it will pull to the other side, and even itself out. Yes, that's just what I'll do. I love the new backsplash! Years ago before I was married, I was very Boho. It's a fun and happy style and it really allows one to let the creative juices flow. I liked your kitchen before and didn't know if I would like this better, but I do! I am also with you on making your space your own even if you rent. I always changed fixtures and painted everything when I rented. As it turned out, the new tenants always liked it and the landlord didn't have to change a thing. One's happiness and contentment is worth much more than a $300.00 deposit. I think so too. You have to like/love your space. Otherwise you won't be happy in it. Life is short. Be happy! Oh and about that plant ~ try turning it a quarter turn each day and it will straighten itself out. You are amazing! I love every little thing about it your new kitchen. I meant to say, I love every little thing about your new kitchen. Thanks! I like it too. I like that's it white and bright. White means clean to me. I'd paint them. Paint is cheap. If it doesn't look right, you can always do something else. I'd ask the paint shop guy to show you a really thick paint like I got, then paint over it with something else. I seriously thought you took up tiling! 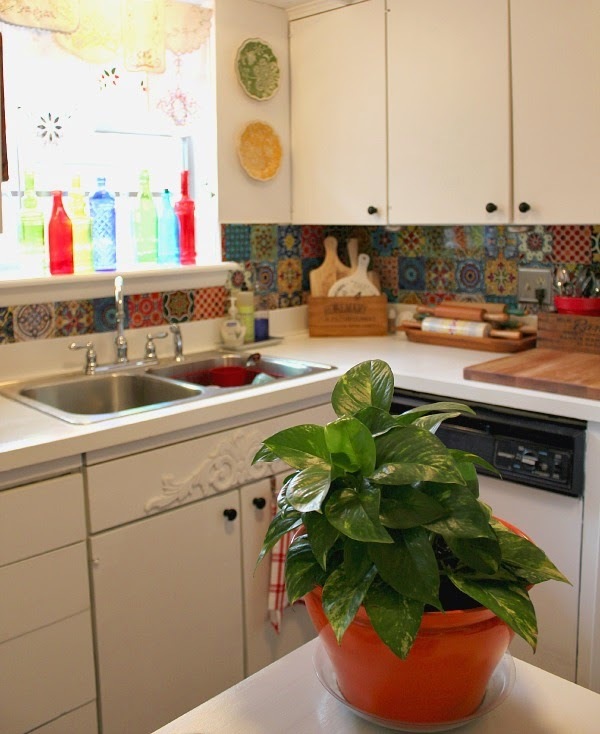 Those Moraccan tiles look authentic and really add to your boho cottage look you've go going on. I love your window treatment made from embroidered linens, too! I think you're wise to make your home your own by investing a few dollars. Your makeshift backsplash adds a nice finished look to the kitchen and your white painted countertops give you a neutral backdrop to add whatever colors you like. I'm pulling my hair out over the mistakes I made when I installed the tongue and groove planking, but they're up and I'm probably the only one who will ever notice…..I hope! Well done, Brenda! Believe me, there are lots of mistakes if you look close! Love, love, love it! You are my inspiration! It's so bright and colorful Thanks so much for sharing with all of us. I'm glad you like it. I'll always share. A fail or a non-fail. I love everything about it! Wonderful job. I think all the white balances out the multi-colored faux tiles. I think your kitchen is lovely! I wasn't sure about the boho look, but you have done a wonderful job. The tiles are so pretty! I really struggled with this kitchen. Just like last time. But I'm liking the lighter/brighter look. Yes, now that I look at this kitchen up against the first kitchen, I do see that it was a bit overwhelming! Wow Brenda. Great colours with white areas of peace. Painting the center island white was a great idea. The fridge and dishwasher look like new. Great idea to put the rubber backing on the counter. No more water down the back of the counter. Love the updated faucet and replaced outlet covers. It was worth the expense to have something you like rather than putting up with the faucet that you disliked. Having your groceries all together makes life easier too. Great window treatment, I think I will try that too. A huge job Brenda that looks wonderful. You took what you had done when you set up your kitchen and made it better. Thanks, Joy! I respect your opinion highly. I didn't want it to be a jumbled mess. But my inclination is always to add more. I tried to cut back on that. Brenda love love love those tiles they look beautiful!! Would you consider going all the way across near your washer and pot rack I think that would look awesome! Loving your window treatment too…so pretty! Well, these aren't cheap. Even faux. With them being shipped from India, that was a good expense. So just my half was nearly a hundred dollars. Can't afford to buy more! And also, what I put them over was laminate. The wall behind the washer is sheetrock. I had a stopping place at the end of the laminate, and that's where I stopped. I didn't have enough to go farther. Love that peel and stick backsplash! The whole kitchen looks wonderful.. You did a great job for so little money! I'd say this was around a two hundred dollar job. What with all the paint, the faux tiles, the switch plates, brushes, faucet, etc. Still a bargain for the big changes you got. Lots of bang for your bucks I'd say! I felt a little guilty buying the faucet. I don't take big purchases lightly. And $69 wasn't a small purchase for me. But I absolutely love it! I'm in love with your new tile backsplash. It's a brilliant idea and so beautiful! Everything you painted looks sparkly fresh and new. I just absolutely LOVE that shot of your colorful bottles on the window sill beneath your pretty new valance. I agree, the chance of losing your deposit is worth having a look that makes you happy. Since my surroundings are so important to me, and since I spend so much of my life in here, I have to have something I truly love or I won't be happy living here. This is a 1960s apartment. It wasn't exactly my taste when I decided to move here. But the fact that I'm kind of off to myself, as much as I can be living in an apartment, and the size of the fenced in patio, sold me. I knew I could take care of the rest. I love it. I think I will try that paint treatment on my counters. Well, it was a cheap fix. Put polyurethane on when you're done and let it cure and you can wipe the counters down like they were laminate or anything else. Brenda, I just learned that rubbing alcohol takes dried paint off everything! My 55 year old Costco stool looks brand new! Good that you brought this up. Very timely. Because I've got dried red paint on a mirror I painted turquoise. I'm thinking of putting it above the washer/dryer so I have a mirror that makes a space looks larger. Will try this for sure! Looks great, and I know you love it! I do too! Who put in the faucet for you, the handy man? The material you used for splash guard or back splash is called cove base. It is often used for a what is a baseboard in some houses though most are wood, like mine are oak. Picture commercial installations like a hospital or school, that is what they might have, in stead of wood baseboard. Usually with vinyl flooring… or it is for a toe kick area. That small, recessed space between the bottom of your cabinets and the floor is known as the toe kick. The toe kick allows you to stand next to your base cabinets without stubbing your toes. Mine are oak also, but many are this hard rubber. AT least it looks like that is what it is ! Either way it looks great. Now I know where I've seen that before! In hospitals, schools, and the like. I'm so glad you told me what it is. Cove base. Well, it works! Oh, and I forgot. Yes, Volare put the faucet in for me. You'll have to tell Volare that he is famous and we all feel like we know him. The tiles are fabulous. I never knew they existed. You did a great job and it looks wonderful. I'm so glad you got this finished and can rest for a little bit – until the next project that is. I have tried to tell him. I don't think he understood. I asked him how his name is spelled so I could get it right. I didn't have a pen handy, but there's I think an "i" and a "y" in there somewhere. Anyone familiar with Russian names? He also ended up putting those cabinet doors on for me. I tried for about an hour. But having one foot on a step stool and the other foot on the counter trying to balance a door to put a screw in just was not working. I walked around and found him and he came and did it for me. Nice man! I gave him this beautiful painting I'd had since 1985 for him to give to his wife. I'm always giving things to him so I feel like I'm not taking advantage of him. He's not supposed to do this stuff. I imagine he walks in the door with stuff and she says: "So what did you do for her today?" The faux tiles are not behind the white splash guard. I was afraid when I put that on and painted it the final white coat, I'd manage to get it on the tiles. so they're just cut up to the edge of it. That rubber piece is baseboard-they used to use it a lot when they installed vinyl flooring to act as the finishing piece between wall and floor. You have done a great job all the way around. Do you know what Ooops is? The product? Ooops will take paint off almost anything…and a little can of it goes a really long ways. It is handy to just keep a little squirt can of it around. I'll have to look into Ooops. And I did take the doors off last year. But it was not as easy to put them back on. So here he came with his electrical tools! Yeah, I imagine he thinks I'm as nuts as the guy with the 10,000 square foot house who is so unhappy. We Americans probably really confuse this simple man who cannot understand why I'm doing these things! the new kitchen is beautiful and so fresh lookingI love, love, love your window treatment. Everything you did looks amazing. And I live your statement to live where you are now. Don't wait for the future.The furure is not "for sure." No, it isn't for sure. Enjoy your life wherever you live. I was guilty of thinking "when I" as a young adult. Now I'm wiser and live in the moment. 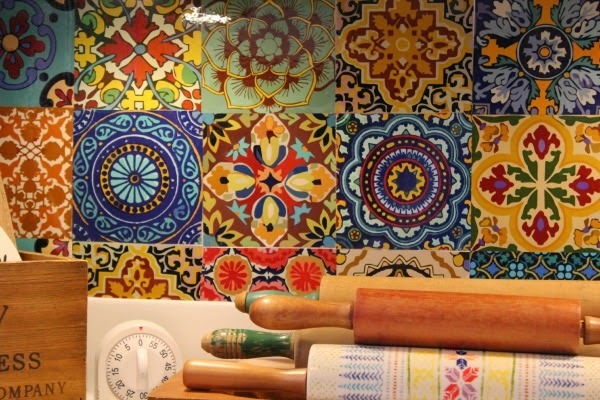 I love it all – especially those tiles which I am pinning. The vintage linens as a curtain is genius. Such a clean and pretty kitchen. i think I'd be in there putseying about most of the day! Today I'm doing laundry, which I've been putting off because it entails me dragging a hose over to the sink. Go look at that Etsy site I linked above and see what all people put those tiles on. I may have to have more! Wonderful ideas, great job and fantastic final look, Brenda! You ROCK! I sure didn't rock that failed oil cloth. Kicked myself for days for wasting $20 worth of Etsy oil cloth. Oh well. Live and learn. You should be so PROUD, Brenda, with the way you accomplished this redo. In the meantime you have learned to not mess with oilcloth! Deeds done/attempted are what count, not how many succeed. Wise words. I just hate to have wasted $20! You are a true artist, Brenda. You can transform any space into a warm, inviting place. Both designs are lovely (the before AND after)! Good on ya! I'd attempt to decorate a tent if one was put up for me to fool with I suppose! Love it, the tiles, and curtains and door back on and everything else about it! Except for the tiles, pretty muted for me I'd say! Once again, you never cease to amaze me! Those faux tiles are terrific. I'd never have known unless I started looking for grouting! They add such interest to your adorable kitchen. It is the perfect size for one. Everything looks so crisp and clean and I never realized you painted the dishwasher! Love the curtains. They keep the sun out and let light in at the same time. So cute. The back splash was a great idea to keep the water off the walls. I so agree w/you, even if we live in a rental, the kitchen is a place we need to be comfortable and we use the sink all the time. Best to be happy w/it. I tend to start painting and not know when to quit. After I did the wall behind the fridge, I ended up painting the next wall, then the next wall, and before I knew it I'd painted one wall of the living room! The dogs better keep moving if they don't want to get a coat of paint! wow Brenda, it's fabulous!!! LOVE those tiles, they totally MAKE that kitchen, great job!!! I can't imagine tackling a real tile job. I saw these faux tiles and fell in love. Brenda, it looks great! I love those 'tiles' and how colorful they are. I'm a renter also and I have been thinking about buying a new kitchen faucet also. I hate the one I have and so what that I can't take it with me, I'll be happier while i'm here and I should be here another year plus at least (probably longer). Love how the counters look also. You really searched out some great products to use! Cottage Boho at it's best! Spring for a new kitchen faucet. You'll pat yourself on the back every day. When Volare took that old one out, I thought, well, I may eventually get rid of the one in the bathroom, which is the same cheap kind. But for now I'm satisfied with that one in the kitchen! I love your kitchen redo! I'm glad you put the doors back on the cabinets. Open shelving bugs me. I like everything behind closed doors in a kitchen. Your new window treatment is so pretty. I really like that idea of using vintage linens. I had all these varied sizes of embroidered linens. It just came to me: why not use the varied sizes to my advantage? Otherwise they're sitting folded in a box. 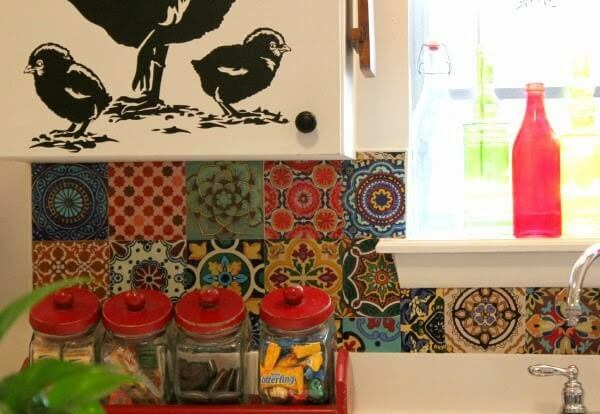 Love those colorful tiles, Brenda! What a great solution. It's such a cheerful room. Now Kim, you KNOW I have to have cheerful rooms. Drab dark rooms would depress me. Wonderful job, Brenda! I like all of the white with your new "tile" back splash. You have such creative ideas. I think you're smart to change out things that really bug you even if it does cost a little to do it – totally worth it to be happy especially when it's something you look at everyday! I have to use that faucet to wash dishes, do laundry. And you just can't clean between those plastic ones. They always looked dirty. Fabulous job, Brenda! Your kitchen redo looks wonderful. I have to admit when I read that you were redoing it, I couldn't imagine it looking better than what you'd already done. But it does! Love the faux tile and I'm going right now to check them out. Thanks for sharing the link. The guys who make them, and they'll make them any size you want, emailed because I sent them the post, and said they hoped it brought people their way. I wrote back that their faux tiles were the hit of the kitchen. Brenda, you've done it again. Genius!!!! The tile looks so beautiful, what a wonderful idea, alto you said it was expensive, it looks more expensive than what you had to pay. How did you ever find it? It looks like it was made for 'your' kitchen. And your vintage linens for your window treatment. LOVE! Again, I don't know how you think of such great ideas, You are a true artist…The white piece behind the faucet looks so nice with your white counter tops. I can't even imagine what a difficult job that must have been..
everything. The one thing I couldn't change. was the kitchen faucet, because it came with the sink. So even tho, it was a nice new faucet, not shabby, I replaced it with the bridge-faucet I wanted, and it just looks so much nicer, and I love how it looks. Like you, it is fun to make your living space "your own". I enjoy reading your blog each day, and really enjoy all of your pictures. Thanks for sharing with all of us. I would LOVE to design a custom built mobile home. If my ex had paid me what he was supposed to, I'd have had more than enough to do that. And that WAS my dream. Good for you that you didn't just live with the faucet that was there. You deserve to have what you want. I am SUPER tired. My back is killing me. My ankle is holding up pretty well. Yesterday was worse. I just wanted it done. I'm like a dog with a bone once I get started. Now that you are finished (at least temporarily;-) are you entertaining?? Must be tons of people lined up to come to your cozy little cottage Boho Kitchen!! How could there not be? LOVE this–all of it. so weird, but my husband and I just finished putting in Mexican Talvera sinks in our Master Bathroom. We used wood to make a vanity. I stained it and put the kind of poly they use on ships to make it more water friendly We also ordered Mexican tiles to use a back splash and toe kicks.Talk about Boho! !…;-) .Thanks for sharing!! Oh, those sinks must be beautiful! No, I only know a few people in this whole big city. All my friends are online. And I entertained today by having all of you see my kitchen. it looks Fabulous… good job Miss- so proud of you and happy for you. You know how bull-headed I am. That would be me AND you. We're all different. To each their own. Hi Brenda! Oh, I love your little kitchen! 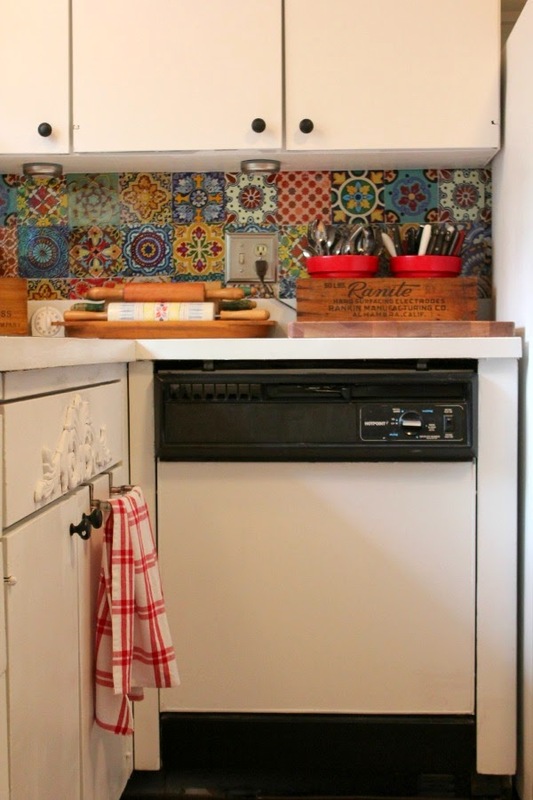 Those tiles you used for your backsplash look wonderful! I love it that you're making your pretty now! I think many folks are afraid to just jump in and begin. your happiness matters most where you live and I'd say your little kitchen thanks you very much! Poor little kitchen. I nearly did it in with hot glue. I love it! I need a nap after reading about all your work. You should be very proud of the finished kitchen (as if any room is ever really finished). I am catching up on my rest for a few days before I get something else into my head! And of course, spring beckons. Absolutely fabulous! I'm stealing the kitchen window idea, too beautiful and I have a ton on inherited linens. The faux tiles are beautiful and I love the 2 plates that go perfectly with the backsplash. I hate to keep pretty things in drawers. Such was my vintage linens. Layer them for use as a curtain. It is fun! I'd be proud if you copied my work! You and me both! Glad you like the kitchen and enjoyed the book. I love your new look! I actually like it better than the re-do last summer (not that that one was "bad"; I just like this look better). I really like the stick-on tiles and I love what you did with the window treatment. You worked so hard and your efforts show. Pat yourself on the back – and now go take a much deserved rest! I really try to rest. But I'm one of those people who doesn't like to be still for long. Which is probably why my ankle does not get enough rest! I liked last summer's too. But now that I have this one to compare it too, I too like this one better. Lighter and easier on the eyes! Your kitchen redo looks so good…love it. I don't know now that I'd want anything other than white counters again. Others can have their fancy counters made of high-end materials. I have had them too. But you can see everything on white. And I like things to be clean. Brenda, No matter how you decorate it always looks fabulous! You have a real eye for design. What inspired me most is your willingness to take risks and make mistakes. I am going to try to remember this in my own life. I love the clean lines of the kitchen. Enjoy your new space. If you don't take risks, you won't fail. But if you don't take risks, you won't know what you can do that will look wonderful either. I am not a risk taker in life. But I LOVE to wander a Lowes or Ace Hardware and just look at what they have. And ask myself what I might use it for that they don't. I love the unexpected! Oh! That is so pretty. Airy and it also looks bigger. I am so tempted to pait my cabnets. My kitchen is so dark! Paint them! If you hate it, paint it dark again. Or put something else over it Paint is cheap. And yes, I am surprised that it does look bigger. A nice surprise I wasn't expecting! Whatever you do, don't hot glue oil cloth to your counter tops!!! You should re-post pictures of the kitchen when you moved in, the first redo and this one all on one posting. It would be amazing to see where it started and where it is now. Love it! Liked the first one – so Mary Englebreit looking, but all the accessories against the crisp white makes it another visual feast! Hey, that's a great idea. I shall do that. 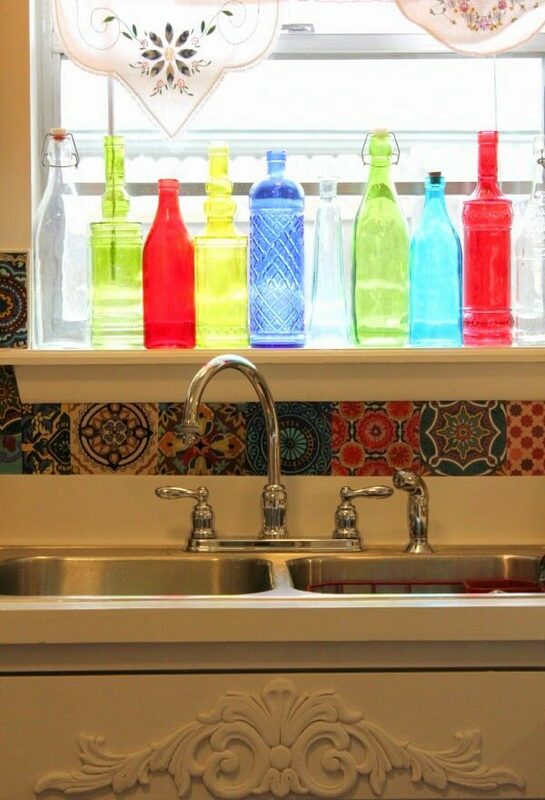 Live the tile stickers, the island, the linen window covering, the bottles, the faucet…. everything. The runner thing that you used for a backsplash is the thing they put underneath the bottom cabinets on top of the floors in new builds. I know this because I took it off my wood cabinet flooring about three houses ago. It looks great the way you used it! I'm always after finding something I can use as something else. That ICE slogan reminded me of my youth too. I found it on Etsy and I believe it's in Denton, TX where he makes them. You can choose your size. I think I paid about $15 for it. Everyone seems to love that when they walk in, because they remember those buildings where you bought ice that had that logo. Well, it's completely different! I appreciate your honesty. I always love feedback. I too love mixing old with new. And you're welcome, of course. Oh My! I love, love those tiles! Was it difficult matching the corners/edges? Well, I had to pull them up and get them straight here and there. I know it's best to just lay it down once and be done with it. But I'm a stickler for getting things straight. And even then, I wish I could have gotten them straighter. I told myself if they come up, I'll decoupage them down maybe with Mod Podge. So if you have a better eye, should be easy for you. I adored your kitchen before, but now? It rocks, Brenda!! Cottage Boho!! I think the tiles is what did it! Wow, I really like it! 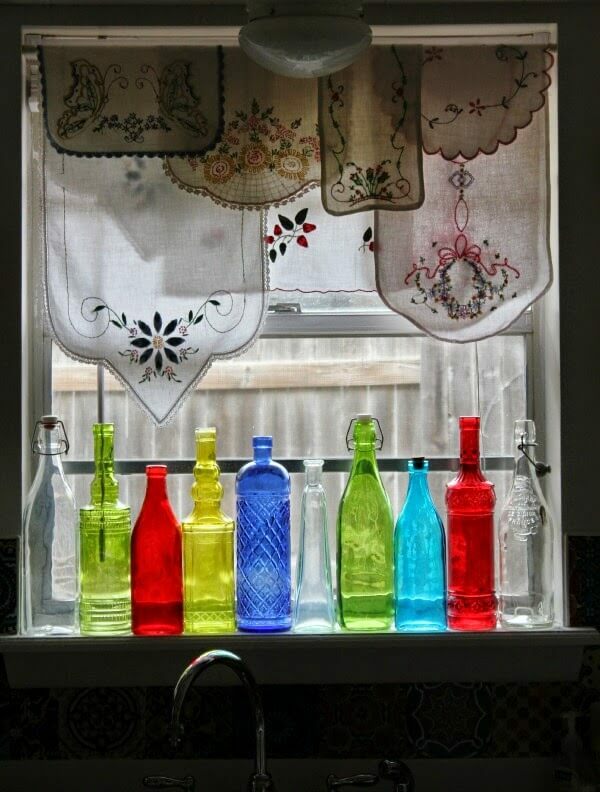 The coloured bottles in the window must be a colour feast when the sun shines on them! Sorry about all of the exclamation marks, I am just so happy and excited with the kitchen! No, just made the Fritos truck comment up. I think I used to say the milk truck, but think that's long out of vogue! I was really struggling until I found those tiles on Etsy. Once you find one magical piece of the puzzle, the rest falls into place, I've learned. saying this as I have my head tilted to the left and a smile….looks great. I love the freshness, cleaness and order. you are pretty ambitious to paint the counters and appliances and i love that. enjoy. Thanks, Laura. When I was married, I had everything most everyone gets now. The fancy stuff. (Except I never liked the stainless steel appliances). It was fine for a time, the granite counter tops, the fancy floor tiles. But it bored me after awhile. 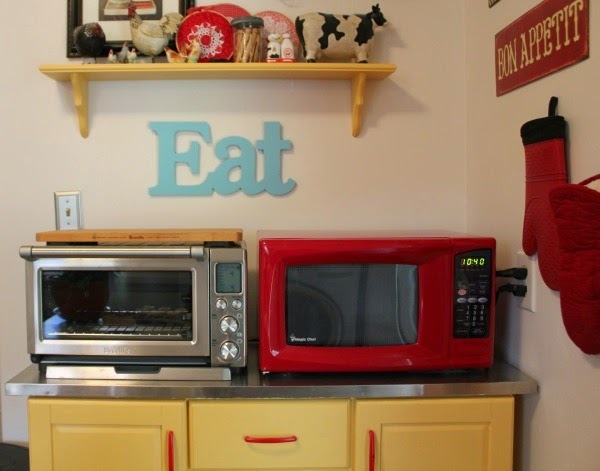 Truly I'd rather just paint my appliances when I'm bored with the look, and that goes with the counters. I don't know if things will work till I try them. (Remember the hot glue oil cloth fiasco? ), but when it works, it's great! Won't know till you try! from the cabinets into the dishwasher. Oh, I have that poor dishwasher filled with cookie sheets and pots and pans and lids since I don't have an oven anymore! Love it! Looks fresher and not so busy. I have already checked out the Etsy shop for those tiles because I think they'll work for my kitchen. Also the stuff on top of the counters (I think it's called cove molding) would work for my kitchen also. Thanks for the great ideas. Well done Brenda! Yes, someone above said it is called cove molding I think. Oh, I'd love to know your experience and see photos if you get the tiles! Which ones are you looking at? They have various combinations. I bought the 5 inch tiles, but they'll make them whatever size you want them. They were very nice. And I love all the other ideas I saw on their site for other ways to use the tiles. Once you get all the materials together, it really doesn't take long to get things done. By the time I'd get one coat of paint on something, it would be time to add another coat to something else. Like a factory line. Brenda . . . I LOVE it all, the new paint, the tiles the whole look is just so fresh and clean! So impressed! I have to laugh because you all didn't see the disaster that was the oil cloth glued down with hot glue that I fussed with for a week trying to make work. When I gave up on that, I just felt deflated. Then I found these tiles and got excited again. Where do I go for ideas that might not be exactly what I want, but will summon an idea? Why, Pinterest of course! Count me in as someone who loves the tiles. In fact, I'm heading over to etsy now to see if they have any that might work for our stairs. The kitchen looks perfect and so 'you'! Love it! I love them on the stairs! They are beautiful in their photo. Makes me wish I had stairs, but then of course I couldn't walk up them! If you do it, you must post it for us! I thought your previous kitchen re-do was very clever, but I like this new look even more. It has a softer, more easy-breezy look to it. The faux tiles are so pretty, but what really makes the room look light and airy are the small touches like the embroidered pieces for curtains and the EAT sign in aqua, the plates on the wall by the window and the pastel bowls on the bottom of the island. Very lovely. If you feel worried about what you spent on the faucet, you could always put the old one back in and take this new one with you when you move. But, let's say you are only there for another six months, and you leave the faucet behind — the cost of the faucet will average out to only about $12 a month. I'd say you definitely will find it is worth $12 a month to you! Enjoy it. Considering I never go to movies or use a smart phone and rarely go out to eat, it is my indulgence. I was actually afraid the embroidered linens on the window wouldn't go with everything else. But then I said to myself: Oh, to heck with it. I'm doing it. Taking some of the red out helped the kitchen I think, and most of the black I had previously. I didn't think anyone would notice the bowls on the bottom of island. You are very perceptive! Hi Brenda…I visit here often and always love what you do! Your cottage boho kitchen is absolutely beautiful. Love those sticker tiles. I would have never known they were'n't the real thing. I'm in the middle of a total kitchen renovation in my older mobile home. The hubby and I decided to renovate what we had that was paid for instead of going into debt to build a new home. We get to personalize it and put our touch on everything we do which I am thoroughly enjoying. You are always an inspiration. I love the colorful boho look you are going for. Happy perfection! Like you, I'd rather keep what I had and not go into debt. Been there, done that. Have fun with your renovations. Take chances! Be different! Enjoy! I love the new look to your kitchen! The bright tiles really stand out against the fresh white areas. I am noticing one thing….please don't take this as criticism….but the white area above your cupboards (soffit?) looks like it could use your special touch…it looks a bit blank to me. But it is YOUR kitchen, so please do what suits YOU! Do you mean put something on the walls above the cupboards? Like plates or something? I don't take it as criticism. After all, I asked you all what you thought of course. I thought about putting something there, but feared it would be too much. Let me know your thoughts and I'll sure take it into consideration! I wanted a boho look without being "totally boho." I wanted to cut down on the clutter and color, which I think I did. A sort of a cottage-y white and clean kitchen with a bit of whimsical color on the back splash. It sure beats the oil cloth debacle! Oh my goodness I love it Brenda! Those stick on tiles really make the whole room, I'm definitely going to go check out that Etsy shop! It looks very homey and cozy. I agree that you should try and love where you live and make the best of it. I just love that Etsy shop. And they were so accommodating. I hope you find something you like, because they can make it however you want it. The last version was cute, but this is fantastic! You might need to start charging people for consultations on what to do to a rental! I'd love to write a book on what to do in temporary dwellings, which to some people don't end up being temporary. Who knows? I may live here forever. However, I did some things that I know the management would probably have a real problem with. But I did it anyway. Not that I wanted to break the rules, but what I had to work with was SO ugly, I just didn't know what else to do. Every unit has the very same kitchen I think. So at least mine is different! I am IN LOVE with those faux tiles. Enjoy all of your posts so much! Well, thank you. Go check out their shop in India. They make the most beautiful designs if you like that sort of Boho Moroccan look. They have different color combos too. And it cost me $45 for the island and part of a can of paint. Sorry, read too fast. Thought you said kitchen island. Hence the first response. And I'll be SO happy for you when you get your own place and can put your own special stamp on it, Laura! 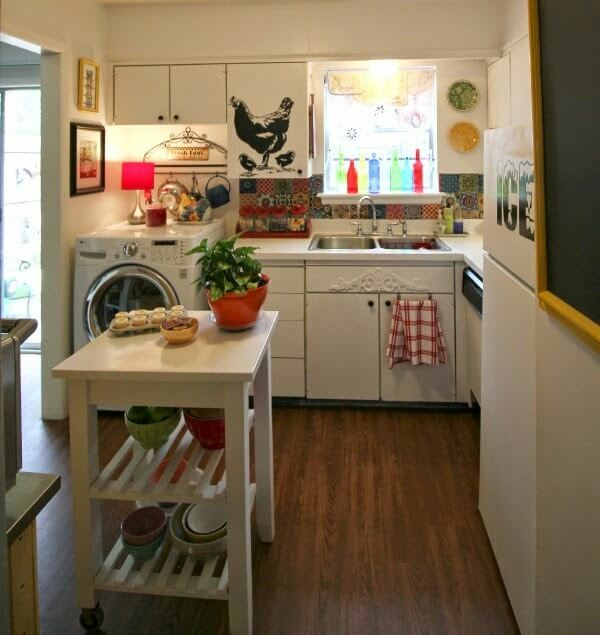 Brenda i love your adorable kitchen!! I love everything about it!!! The tiles are perfect. It's just adorable. Well, one thing you can usually count on is that whatever I do, it's going to look a little different because I look for ways to go the cheap route. Now I've taken the black metal piece that was above the washer/dryer off and am trying to figure out what I want there. I knew I wasn't pleased with that area. It will come to me. It looks great! I never heard of those tiles before but Iove them. I'm sure I need some! Me either. I stumbled upon them. It looks wonderful! I love the "tile" and the window treatment. So clever! I Love your Talavera tiles! And your upgrades too! I'm looking forward to make my own. Thanks for sharing Brenda! They have so many fun colors to choose from! 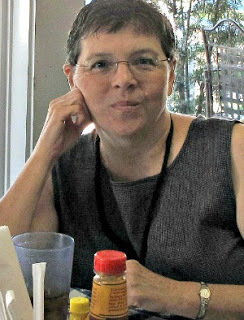 Brenda….long time follower, first time responder…. Girl, you knocked this out of the ball park! I absolutely LOVE it! Enjoy and I totally agree with you that if you don't get your deposit back it was so worth it, but I can't imagine that happening. It looks so much cuter than it every could have as a rental. Thanks for commenting, long time follower! However, I just appreciate that you read it. I love the new backsplash. It adds so much colour and I love how you draw attention to eat by adding a lot more white than before in your kitchen. Great job! I kept adding white paint, and wondered if I was overdoing it. But those colors are just so bright. I had a failed attempt with hot glue and oil cloth before I came up with this one! Love it Brenda! The tile cover things look so nice and like real tile and I love the window area. The bottles with the cute valance – soo pretty! So glad you found a solution to the counter top problem – it looks good. I like the cabinets with the doors on – I've never been a fan of open shelving in a kitchen. Great job! I agree – you have to be happy where you live so if you're renting that may mean putting in a little bit of money. We're probably moving in October but that didn't stop us from chaining a few things and paying to have the yard cleaned up! Already? Well, I do think you have to love it while you rent it! I was thinking plates in the area above the cupboards, or maybe flat baskets or trays….but some other thiings could work also. I have seen pics of faux ironwork made from paper towel/toilet paper tubes. Even stenciling could be interesting. You could probably think of something creative. This blew me away Brenda! I was not expecting such a great makeover and done on a dime as well. The tiles are awesome and you did good by limiting the color going on. I like the valances, too, that's thinking outside the box! LOVE IT! I realize the other one I did last year was a bit overwhelming. I like this one better. Nice bright and happy kitchen! Looks so fresh and ready for spring! I knew it would be fabulous! I'm sure someone mentioned it already in comments, did not read them all but plants tend to "grow toward the window/light. I know. I suppose I didn't turn it. Hi Brenda, LOVE your Boho Cottage kitchen. Those faux tiles are awesome and putting the doors back on the cabinets was a great idea. The floor molding was a grand idea too for your back splash. You did a great job!! and ~ I love the window treatment using the linens and hankies. Thanks! At least it beats the "failed oil cloth idea." Wow! Is about all I can say! 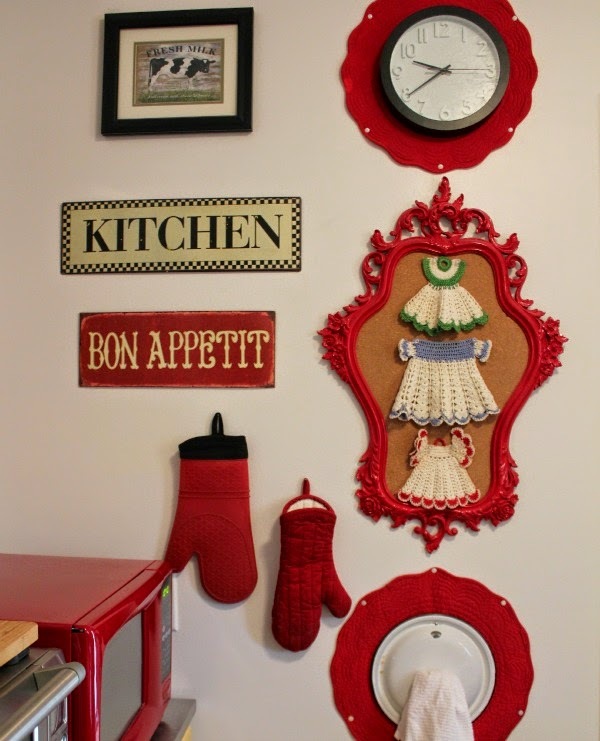 Though I like it all, I really liked the red place mats behind the clock and the lid and then using the lid as a tea towel hanger. How do you keep the lid on? Are those white tacks you have around the edges of the place mats? Like the frame around the 3 little dress hot pads. I save (hoard?) kinds of vintage hot pads but not the dresses. Love the Boho you've done on the front room and the kitchen. Do you miss your full sized oven? I've lived (rented) where I am for almost 1 year and I think I've only used the oven once. Mostly the microwave. Use the same burner all the time. I don't intend on staying here for much longer (fingers crossed!) and I think it's going to be something to think about. Can't wait to see what you're going to do next! Nope. Don't miss the oven. Don't miss checking it three or four times to make sure I turned it off before I could go anywhere either. I was compulsive about that! 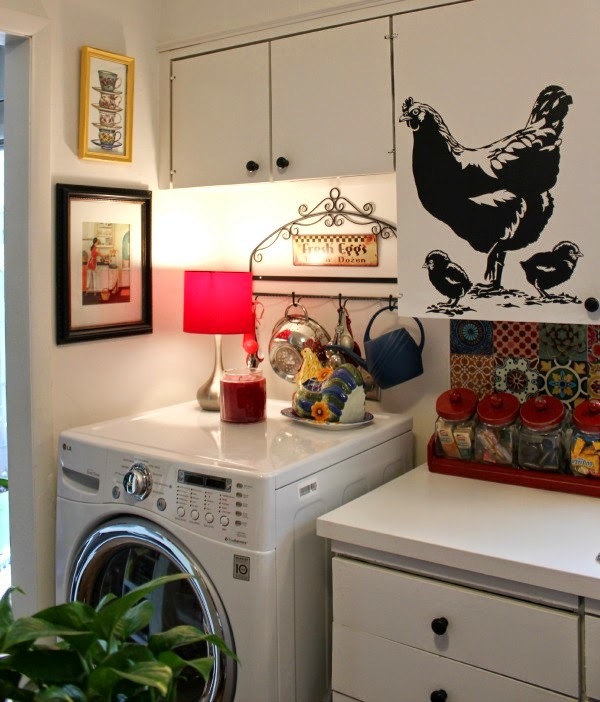 Brenda, I absolutely love the new look of your Boho cottage kitchen! You are so wonderfully creative! Those stick-on tiles are amazing! I love your humor while describing the process of redoing the kitchen. In love every detail. Brenda it is FABULOUS!!! I love it, each detail is drawing the eye in. 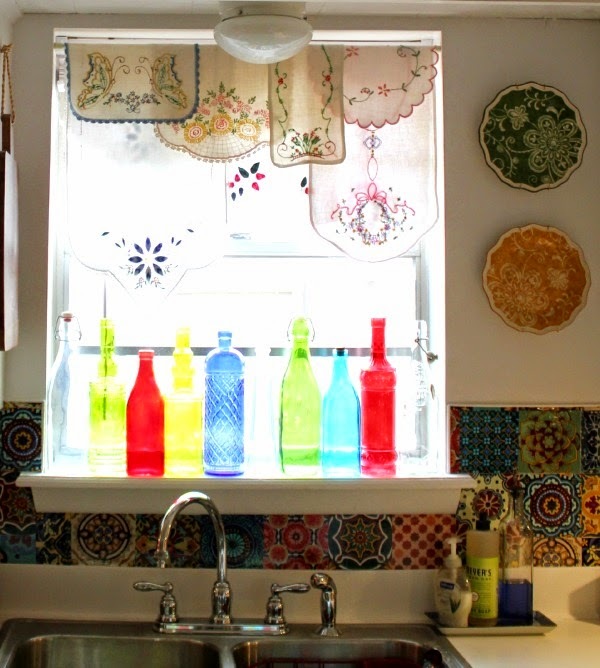 I adore the vintage linens on the window, the colorful bowls and sign, the gorgeous tiles and the white counters. I think you are very clever. Having the cupboard doors on streamlines the look and draws the eye to the colors. I liked the one before but this is phenomenal. I wish I had rental freedom to make changes but here in CA our deposits are over 1500 or more, (my current deposit was 3000)( and they specifically disallow any changes in the lease which is common here. They also do not do upgrades or approve any request for changes. So you are very lucky and to have a on site handyman, wow. What a great deal. . I make do with décor I love but to have the freedom to make real changes must be so fun. Well Done! Just beautiful. It sounded like it was a extreme amount of work and to accomplish all those upgrades by yourself is very impressive. I really like the window……it has a warm, creative vibe. Beautiful! I love your kitchen. It is so colorful and has so much personality. Great job!